Sierra Leone’s fishing grounds are among the richest in West African waters. Thousands of tons of fish are caught in Sierra Leonean waters every year. But not all of them are caught legally. It is estimated that Sierra Leone is losing up to 29m US$ due to illegal activities such as IUU fishing. This article continues the series of environmental reports on illegal activities in African countries’ territorial waters. In 2006 the figures from the UN’s Food and Agriculture Organization (FAO) assumed the fisheries’ share in Sierra Leone’s GDP of 9.4 Percent. The total Capture Production resulting from FAO fishery statistics amount to 200.000 tons of fish in Sierra Leonean waters only in 2009. The fishery sector in Sierra Leone can be broadly classified in three sub-sectors: (1) the industrial fishery, (2) the artisanal fishery and (3) the aquaculture and inland fishery. This article concentrates on the industrial fishery because here Illegal, Unreported and Unregulaterd (IUU) fishery mainly occurs in large dimensions. But beside that artisanal fishery is also of high importance when it comes to the problem of IUU fishery. The catches are mostly meant for local markets and the population’s food supply. Fish is the cheapest source of animal protein in Sierra Leone and therefore important for people’s diet. Of course the impact of this protein supply is higher in the coastal areas simply because of the availability and accessibility of fish. Apart from the importance for people’s diet artisanal fishery also represent an important job market. It is estimated that almost 250.000 jobs are provided by the artisanal fish sector. While about 30.000 fishermen are directly employed, another 200.000 people carry out ancillary activities such as fish processing, marketing, boat-building and engineering. Today these named fields are under threat. Illegally operating international fishing fleets push forward into Sierra Leonean waters well-aimed. Vessels of the world’s biggest fishing companies operate off the West African coastlines. While Somali waters were before scene of systematic and illegal exploitations of the marine resources, West African waters turned into another scene for fish piracy that is taking a turn for the worse. Only recently I had an incident. We went out fishing in the morning, and laid our nets. We then saw a trawler heading straight at us. We waved and shouted, but it kept coming right at our canoe. Finally we had to jump. The trawler hit our boat…it didn’t stop at all, not when they were coming at us, nor once we were hit and in the water. We had to be rescued. 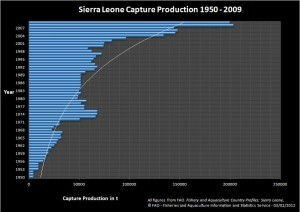 Sierra Leone is one of the world’s poorest countries. On the Human Development Index it can be found on the 180iest position out of 187 (HDI 2011). The country was shaken by a devastating civil war which weakened the government in Freetown enormously. Governmental institutions have no effective control over many fields in the country. The country’s territorial waters are just one of such fields to be named. The weakened government and a lack of effective monitoring facilities constitute the optimal scene for illegally operating fishing vessels. This pirate fishing stretches from fishing in inshore waters reserved for local fishermen, using banned fishing methods, misreporting catches and transshipping fish illegally at sea to the above mentioned destroying of the fishing equipment of artisanal fishermen. Beside the systematic destruction of the basis of one’s livelihood, the illegal activities also affect the region’s natural biodiversity. Catches are not reported properly or sometimes not at all. This makes important regulations of numbers impossible. Moreover irresponsible catch methods such as the use of trawl nets destroy the seabed. Another side effect of this devastating method is the high amount of bycatch. Often species are bycaught that are unimportant for the companies’ exports. 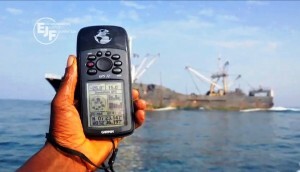 The Sierra Leonean Joint Maritime Committee (JMC) that consists of the country’s Navy, the Ministry of Fisheries and Marine Resources and the police, implemented a vessel monitoring system (VMS) for the territorial waters. Every licensed vessel that is operating in Sierra Leona’s IEZ is supposed to have an activated VMS on board. Via this system, fishery officials can monitor and reconstruct the vessels’ activities systematically. Every listed vessel has a specific history. The illegal operating trawlers for their part often enable the monitoring systems. Following, officials were not able to observe their activities and vessels can move nearly free in the zone. There is also the fact of corruption within the complex network of Sierra Leonean institutions and officials. According to investigations carried out by Al Jazeera there are corrupt arrangements between the Navy and some vessels’ crews. They avoid the controls of the navy by giving those bribes in form of money and fish. Informants told Al Jazeera that the involved navy officials are of the highest level. For the local population this fact has devastating consequences. The officials who are supposed to protect their fishing grounds and hold the vessels liable for their illegal activities are actively involved in the criminal business. There exist several plans of action to tackle the problem of pirate fishing in West African waters. The European Union as well as NGOs such as the Environmental Justice Foundation (EJF) systematically tries to put a stop to the exploitation of African waters. Besides strict controls and introduced certification processes, local structures are supported and monitoring systems pushed forward. 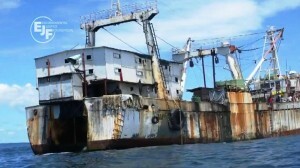 Pirate fishing in Sierra Leonean waters is a threat for Sierra Leonean fishing communities. Moreover a biodiversity is in danger that should be sustained for future generations. But until pirate fishing will finally be killed stone dead, a lot of facts still need to be tackled. THROUGH THE NET from Environmental Justice Foundation on Vimeo.